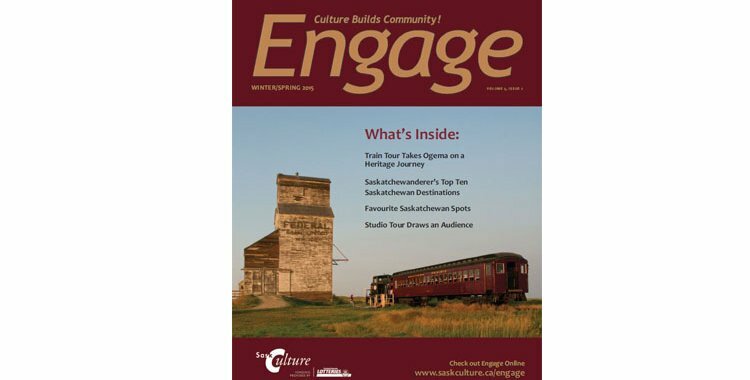 The latest issue of SaskCulture's Engage magazine has been posted online, you can view an interactive, shareable, online version of the magazine on your smartphone, tablet or desktop computer, or you can view and download the PDF. The Winter/Spring 2015 issue is focused on culture and tourism and features articles on the All Folk'd Up Festival in Montmartre, the Moving Forward, Never Forgetting exhibition that is on right now at the MacKenzie Art Gallery in Regina, the Windscape Kite Festival in Swift Current and much more! There were also two episodes of the SaskScapes podcast created in conjunction with this issue of Engage, one on the Windscape Kite Festival and one about the Festival of Words in Moose Jaw. You can stream them by clicking on the links above. Curious about SaskScapes? More information is available on SaskCulture's website.